Jones, S.C., Mannino, N.L. & Green, J. (2010). 'Like me, want me, buy me, eat me': relationship-building marketing communications in children's magazines. Public Health Nutrition, 13 (12), 2111-2118. Copyright Cambridge University Press 2010. DOI: 10.1017/S1368980010000455. Objective: Television, Internet and print media are saturated with advertisements for unhealthy food that use marketing tactics aimed to build long-term brand loyalty and ‘relationships’ with children. 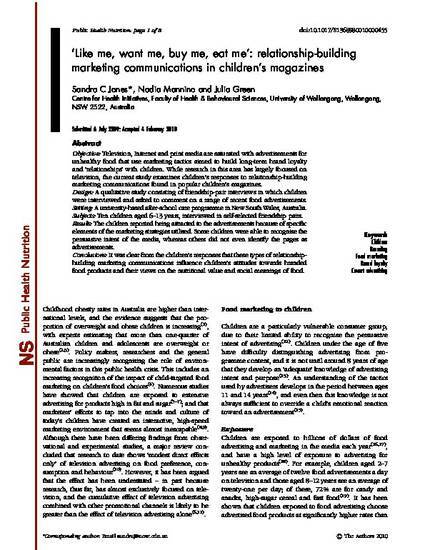 While research in this area has largely focused on television, the current study examines children’s responses to relationship-building marketing communications found in popular children’s magazines. Design: A qualitative study consisting of friendship-pair interviews in which children were interviewed and asked to comment on a range of recent food advertisements. Setting: A university-based after-school care programme in New SouthWales, Australia. Subjects: Ten children aged 6–13 years, interviewed in self-selected friendship pairs. Results: The children reported being attracted to the advertisements because of specific elements of the marketing strategies utilised. Some children were able to recognise the persuasive intent of the media, whereas others did not even identify the pages as advertisements. Conclusions: It was clear from the children’s responses that these types of relationshipbuilding marketing communications influence children’s attitudes towards branded food products and their views on the nutritional value and social meanings of food.